Free Kick Positioning 5 Man 4 Man 3 Man. Free Kick Positioning 5 Man PIAA Mechanics. Download ppt "Free Kick Positioning 5 Man 4 Man 3 Man. Free Kick Positioning 5 Man PIAA Mechanics." ASHAA Football Mechanics Basic Keys and Responsibilities for a Crew of 6 Officials August 2009. NFHS FOOTBALL Officials ManualOfficials Manual. Illegal Football Field Rule 1-2-3b NOTES 2. © REFEREE ENTERPISES INC RULE CHANGE Illegal Equipment 1-5-3c(8) Play cards must be worn on the wrist. IACAO Football1 National Federation 3 Person Mechanics Football. 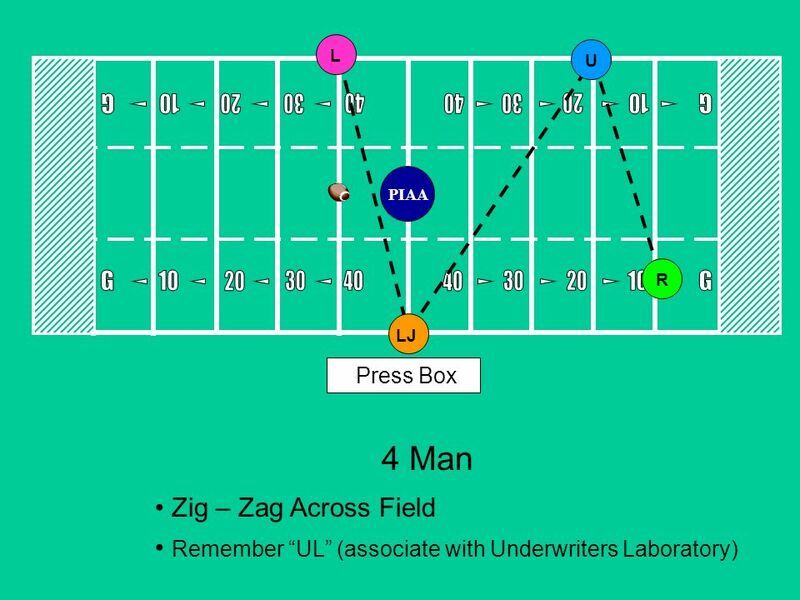 2012 Collegiate Commissioners Association Football 7 Man Mechanics CCA. 2011 Collegiate Commissioners Association Football 7 Man Mechanics CCA. 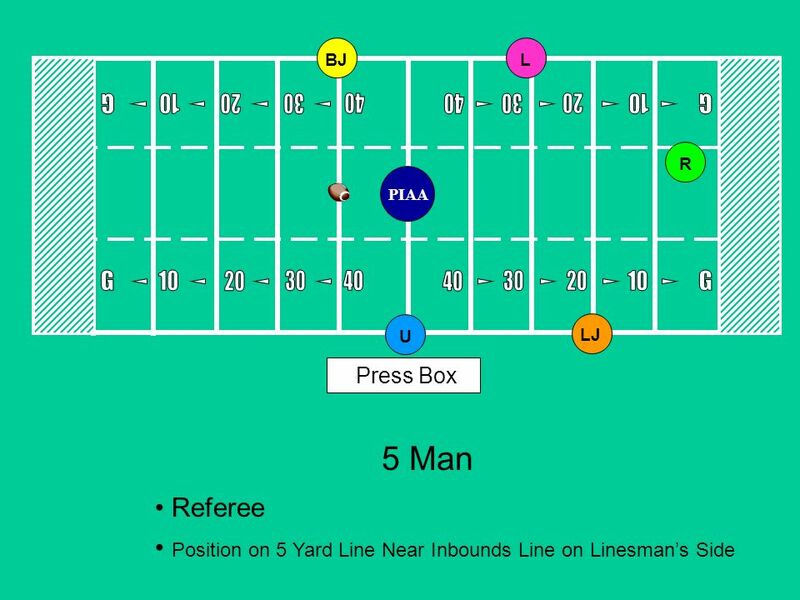 Five man Passing Keys Based on the NFHS Officials Manual by Grant Christianson Greater Kansas City Officials Association. 1 Football Mechanics for Five Officials Original Presentation by Timothy Kiefer & Octavio Herrera of IACAO. - RULE 6 - Kicks Presented by Gary S. McCarthy, Jr. Kenneth Southworth, Jr.
6 Man Mechanics. 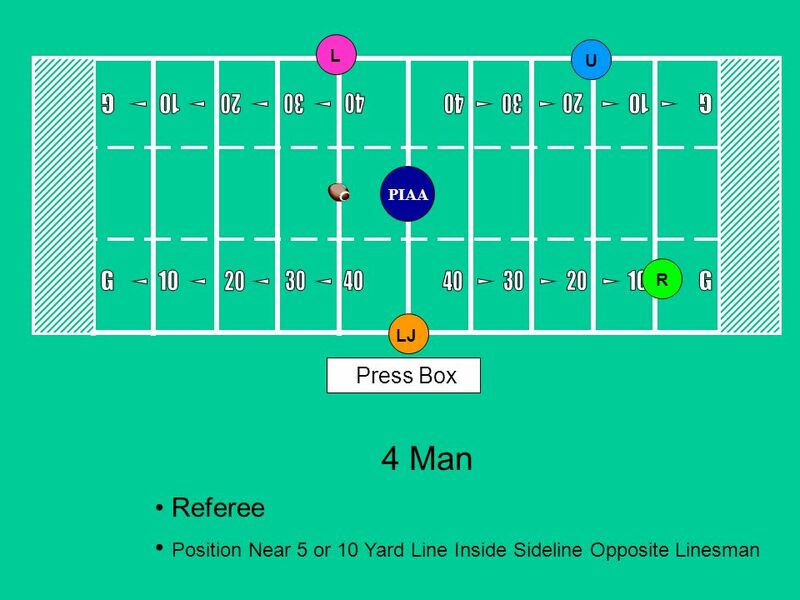 For all 6 Man Games, we will follow the MPSSAA Manual with a few minor exceptions. 1.Coin Toss – H & LJ – Stay on sideline and observe. Five Officials Umpire Position - Kickoff ABefore Kick: 1Position: R’s restraining line on sideline opposite linesman. (Press Box Side) 2Count R players. Review of 3 Man Mechanics. Kickoffs Referee is 5 yards behind deepest receiver. LJ & HL Count players. START WITH THE CORRECT AMOUNT OF PLAYERS!! LJ. The Passing Game The Passing Game Mechanics/Keys/Responsibilities Mechanics/Keys/Responsibilities. FOOTBALL It's a game of inches. It's a game of controlled collision. It's a game of options. THE RUNNING GAME WNE/WAIFO Dr. Tom Mawhinney. THE RUNNING GAME  Pre-snap  At the Snap  During the Run  Red zone/Goal Line  Blocking Philosophy.